The Death Scythe in charge of East Asia. 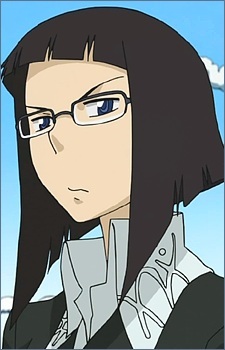 She comes off as being bookish and analytical, she is very respectful to all, she was the one that talked Marie out of marrying a toilet using wordplay. She was the student council president when Stein and the other Death Scythes were students, she was the person that scolded Spirit for his endless flirting and Stein's urge to dissect everything, she was said to have been a small, yet talkative child. She still treats the others as little kids like a teacher would (clapping to get their attention and telling them to line up and walk in a single file line) much to the embarrassment of the others. In recent chapters it is shown that she takes the form of a crossbow, able to fire high pressure spirit shots up to 10 km accurately. She is also suggested to have a genius IQ, and is an extremely competent information gatherer and tactician, easily finding one of Arachnephobia's labs.